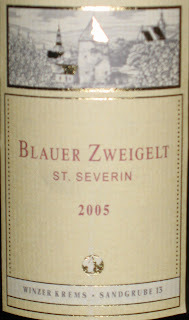 I first had a Zweigelt wine during a visit to Vienna. The grape’s original birthplace is in Austria and many say the varietal is close to a Pinot Noir. My story began, in 2007, while on a hunt for good homemade Wiener Schnitzel at a recommended Gasthaus, which is generally where you’ll find traditional dishes, homemade specials and a pleasant home-like atmosphere. These places are somewhat hard to find in the big cities anymore and more prevalent in the countryside towns. On our hunt, we must have passed the restaurant 3 times circling the block since it was so small with minimal signage. In the end, it was worth the adventure as the meal was wonderful along with samplings of at least 4 local beers I couldn’t even begin to remember. So, I decided to buy a bottle of Zweigelt and make our own Wiener Schnitzel with egg noodles and mushroom/rosemary gravy here at home. This wasn’t the exact same wine from Vienna although the Winzer Krems vineyard is in Krems, Austria which is a small town located 55 miles northwest of Vienna. The city is over 1000 years old and rich in history. With rich scents of ripe berries, black pepper and a hint of molasses it definitely brought back memories of that wonderful dinner. Tastes of plum and black cherries combined in this easy drinking wine with soft tannins and fruit forward flavors. An essence of licorice, spice and tobacco existed in its velvety finish. Considered to be a medium bodied wine, I’d love to find another bottle however I believe the 2006 is now what’s out. I guess I’ll have to try that vintage as well. I found it at Total Wine although you can try here to find a distributor near you. I love your posts, but can't figure out how you taste all of those flavors! I think my tongue's broken. It was nice reading about your search for a typical Austrian restaurant. Really hard to find these days in Vienna. For the perfect Schnitzel go to "Schnitzelhaus" in Neubaugasse ($), or Figelmueller in Baeckerstrasse ($$$). However, I would like to remark that in Austria, Schnitzel is never served with sauce or gravy, noodles are also a very unusual side. We usually serve Schnitzel with a wedge of lemon on top (you squeeze some on the meat), and rice or potato salad on the side. An alternative to potato salad are parsley-ed potatoes (after you cooked them to the point, you throw 'em in a pan with oil and a handful of parsley. then roll them around for 3 minutes). Some people also use cranberry jam as a dip. (I know it sounds weird...at least thats what my American wife is telling me).